old. Motorbikes were the theme of Busani’s conversation with us and his Dream was to either have is own motorbike or to have a motorbike ride. 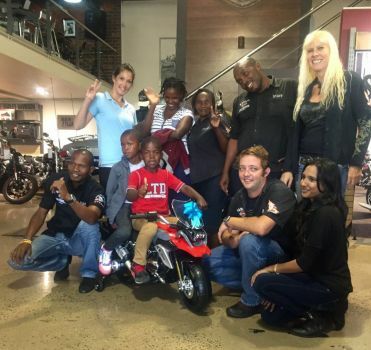 With the gracious assistance of Anthony and his team from Harley-Davidson® Durban, Busani was able to have both his first motorbike ride, as well as his very own motor bike (kids, electric). Both Busani and his brother were in absolute awe of all the motorbikes on display at H-D® Durban and were overwhelmed as they got a chance to sit on a few and even started one up. The excitement grew as both boys were taken to the workshop to see how the Harley® team work on the bikes. Once they boys had seen all that was to offer on the floor, the guys from Harley® Durban took the boys out for their very first bike ride. Looking back in their mirrors, it was reported that both boys had smiles from ear to ear all the way to the Umhlanga Village and back. On returning, a kids electric motorbike was waiting for Busani and he was overjoyed to have his very own bike. Busani rode his bike as if he had been riding for years. He even rode it all the way up to his hotel room! The family's hotel room (Coastlands Hotel Umhlanga) was graciously sponsored by H-D® Durban. In the morning the family had one more visit at the dealership, Busani rode his bike all the way back to showroom! The family were afforded the opportunity to have breakfast at the H.O.G. Diner upstairs in the dealership which was the glazed cherry on top of an incredible Dream and experience. Anthony and the Team from Harley-Davidson® Durban gave each boy their own H-D® back pack, filled with a packed lunch and goodies for their travel home. The family were so grateful and appreciative of everything they received and the experience they were able to have. Reach For A Dream fulfills Dreams for children with life threatening illness, between the ages of 3 and 18. Written by: Danielle Olivier, Reach for a Dream.